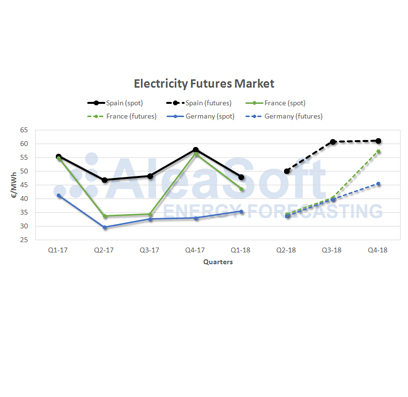 May 16th, 2018.- Spanish electricity futures for the remaining months of 2018 are experiencing an important growth, mainly in the last couple of weeks. The electricity futures for this year’s third quarter (Q3-18) was quoted at 58.40 €/MWh on April 30th in OMIP futures market, and this Monday, May 14th, it settled at 60.90 €/MWh, above the 60 €/MWh psychological barrier. 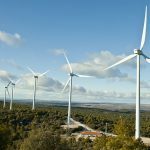 The same goes for the last quarter of this year (Q4-18), the futures price grew from 58.10 €/MWh, at the beginning of the month, to 61.25 €/MWh, price quoted on Monday. The same factors that are pushing the price of the spot market up are impacting the futures market even to a greater extend. The current conditions in the Spanish mainland electricity system, with large hydroelectric reservoirs but being sold very expensive and a shutdown nuclear plant (there were two until Monday), together with expensive fuel prices, and CO2 emission prices going up, help the electricity price keep rising. The climate of distrust due to the instability of the international geopolitical situation causes concern among the electricity market agents that translates into expensive futures prices. The announcement of president Donald Trump to withdraw US from the Iran nuclear deal and the intensification of the conflicts of Israel in Iran with Syria and the Palestinians are causing price increases of the commodity and fuels futures, some of them used in electricity generation. Another important factor is the increase of the CO2 emission rights price (EUA), that since January grew by 6 €/t, up to values not seen since 2011. AleaSoft stochastic forecasting for the two last quarters of the year, take into account a reversion of the fuels prices increases as a realistic possibility if the instability international situation changed. 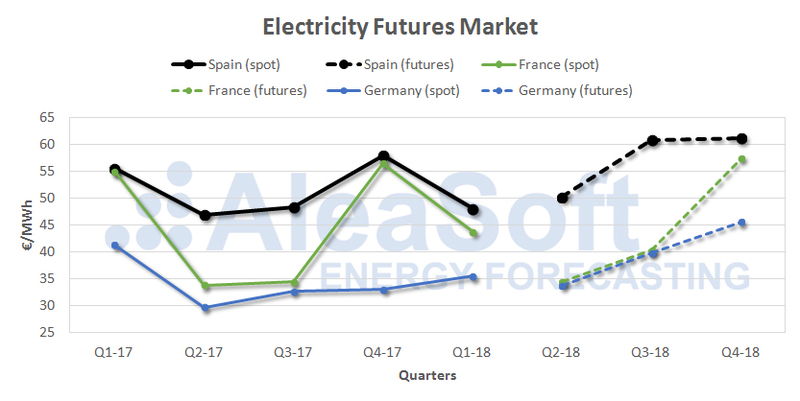 At present, AleaSoft estimates that the electricity futures for the two remaining quarters of 2018 are overstated by around 4 €/MWh, and the probability of the average spot price in Q3-18 hitting 60 €/MWh is virtually nil. Q2-18 futures values include spot prices up to 05/15/2018. Sources: Spain (spot): OMIE, Spain (futures): OMIP, France and Germany (spot): EPEX SPOT, France and Germany (futures): EEX. The rest of the European countries are not immune to this instability situation. The electricity futures prices for the third and fourth quarter in France and Germany increased between 2 and 4 €/MWh since the beginning of May. But in this case, we are talking about prices than can be as much as 20 €/MWh lower than the Spanish futures.